At Minneapolis's School of Environmental Studies, learning is about becoming an expert and solving real problems. When Mark LaCroix and his classmates at Minnesota's School of Environmental Studies (SES) discovered patches of buckthorn crowding out native species at a local park, they didn't just write up their findings as a science report to be read by the teacher and then handed back. They compiled data in a form familiar to government agencies and submitted a technical report to local officials, who used the information to direct park gardeners to eradicate the invasive plant. At SES, learning is about becoming an expert and solving real problems -- doing in-depth, interdisciplinary research using innovative technology that results in practical applications. Every aspect of the school, from its curriculum and close student-teacher relationships to the architecture of the building, supports the school's get-out-there-and-do-it approach to learning. SES opened in 1995 in the Minneapolis-St. Paul suburb of Apple Valley as a public, 400-student "high school of choice" for grades 11-12. Also known as the Zoo School because of its active partnership with the Minnesota Zoo and its 12-acre site on zoo property, the school embraces project learning with an environmental theme. A number of students work with zookeepers and scientific staff in studying animal behavior, keeping animals active and challenged, and promoting public transit to the zoo. Credit: Courtesy of U.S. Department of Education and HGA Inc. The forum, which can be reconfigured in a number of ways, serves as the core of life at the School of Environmental Studies. "I feel like I'm not learning in a box of fluorescent lights like I was in my first years in high school," says student Kelly Carlin. "I'm learning in a classroom, and I'm learning outside by a pond. I'm learning in a local park. I'm learning at the zoo, working with people who are doing stuff in the field. We do a lot of stuff that has a significant impact on the community." Like all SES students, Carlin came to the school, which admits half of its students through a lottery system and the other half based on an essay, after attending his neighborhood high school for his freshman and sophomore years. The school reflects the district's ethnic makeup, which is about 92 percent white. "We spent a great deal of time figuring out what was the best way students could be educated, and we came to some basic ideas," explains SES teacher Tom Goodwin, one of the creators of the school. "One of them was that students should be workers, and that teachers should take less of a central role. Another was that students should be able to move around, and that there should be some sort of center of the school. And everyone's group, everyone's 'house,' would more or less face that central location." The construction of SES was an all-too-rare case of fitting the building to the academic program, says Principal Dan Bodette. "Once we fleshed out our entire two-year program -- which took two years -- we then went to the architect and said, 'Architect, please design a building that will meet our needs, our expectations for how kids are going to learn best.'" Principal Dan Bodette (left) says SES illustrates the value of fitting the building to the educational program. Kelly Carlin (right image on left), Mark LaCroix (middle), and Lauren Dees (right) say SES is a perfect fit for them. 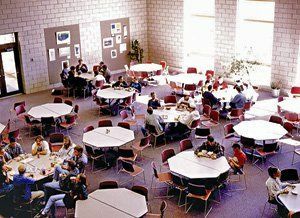 The building architect Bruce Jilk ultimately came up with in consultation with educators, parents, and community members focuses on giving the school a family feeling. Students and teachers are grouped into houses -- about 110 students and three or four teachers teamed up for three hours every day. When the entire house meets, tables and chairs may be arranged in a semicircle or rows. If community members are coming to watch student presentations, the configuration changes, as it does when small groups work together on projects or when the area needs to be cleared of furniture to create a large, open space. The building speaks to the collaborative relationships among students and staff and to the idea that students are supported to go as far with their learning as they are capable. Each house includes a shared office for its teachers, and the office door is always open. Students form relationships with other teachers, students, and staff through electives, projects, Socratic seminars, and general mingling in the community areas. Carlin notes that he knew only 5 percent of the teachers at his home high school, which enrolls 2,200 students, and so only 5 percent of the teachers trusted him. The other 95 percent did not, as evidenced by locked doors and the lack of access to teachers and academic areas after school hours. Student Lauren Dees says there's definitely a relationship between academic achievement and the welcoming environment, which includes trust, responsibility, and being judged on ideas, not appearance. There are no lockers or hall passes at SES, and students are encouraged to go where they need to go to do research, confer with other students, use a computer in their house or down the hall, or work on video, audio, and Microsoft PowerPoint projects in the media center. They may stay at the school until the last teacher leaves. The friendly, no-cliques-tolerated school atmosphere "just meant that I was a little more open to what I was learning," says Dees. "I was a little more interested." The main "building block" of SES, says Jilk, is the student workstation. The workstations look like typical office cubicles, with storage and books and other study accessories. But the most interesting workstation artifacts are the ones that tell about the person whose workstation it is -- snapshots of a mountain climbing trip, magazine cutouts of small airplanes, photos of celebrity heartthrobs like Josh Hartnett and Angelina Jolie, and stuffed monkeys and lizards. An architectural rendering of a student's workstation illustrates what architect Bruce Jilk calls the "building block" of SES. The building block of more traditional schools is the boxy classroom with desks arranged in rows facing the teacher, says Jilk. "If you put 30 kids and a teacher in a 900-square-foot room, guess what?" he asks. "The teacher is going to take control and start lecturing. So we needed to break that kind of mold, or model, for this school." Students are grouped into pods of about ten, and about ten pods form a house. Pod members make their own rules ("No hissy fits. Trust. Respect everyone's individuality. Don't worry, be happy," exhorts one pod poster) and often do academic work together. It's common for each member of a pod to be assigned to read an article or a chapter and then explain that text to the rest of the group. Pods may also have homework nights at one another's homes or regular lunch potlucks that further the feeling of family and the idea of educational collaboration. Jilk notes that the school also is used as an environmental textbook: Students learn that the building materials, such as a composite of concrete and wood, are renewable. The exposure of steel beams is designed to demonstrate how architects work with gravity, and the exposed ductwork shows how air moves throughout the building. Recycling bins are ubiquitous, and there are no paper towels in the restrooms, only hand blow dryers. Much of the art is made of recycled materials. 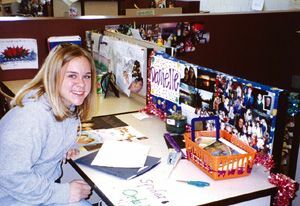 Students decorate their cubicles to reflect their own personalities and interests. Projects run the gamut of topics, although they usually feature an environmental focus, and they often have a community-service aspect. They also cross disciplines so that relationships are made between science and other subjects. Every year since the school started, for example, juniors have conducted pond studies. Using instruments like probes, Secchi disks, dip nets, and seines, they monitor oxygen levels, clarity, and temperature in the water and collect plant samples. They make computerized charts and graphs and write technical reports about their findings, which they share with local agencies. Students' understanding of water is further broadened through literature by reading such books as Dune, by science fiction writer Frank Herbert, and travel writer Bill Bryson's A Walk in the Woods. Besides thematic studies, elective courses are offered in math, science, technology, photography, and world languages, as well as Advanced Placement classes. Students may return to their home high schools for extracurricular activities or classes that might not be offered at SES. Investigating Minnesota's Boundary Waters is one option during the school's ten-day intensive-study program. For ten days out of each trimester, students take part in an intensive study of one subject or travel to such places as Alaska, Costa Rica, Mexico, Scotland, or Minnesota's Boundary Waters region to study and perform community service related to the environment. Many students attend SES because of the environmental focus, but Bodette has heard a wide variety of reasons for students' attachment to the school -- from being given the opportunity to learn a great deal of information in depth to working together to being known by other students and teachers to being able to present research to outside audiences. "They get excited about that," Bodette says. "A lot of kids are changed by coming here," adds student Mark LaCroix. Students who may not have been particularly interested in school find that learning can be fascinating and fun. "You'll begin to love learning, and it'll just all come to you," LaCroix says. At the same time, kids who already possess a stellar academic record will find that they don't know it all. "They'll come here, and they'll be humbled a little bit," LaCroix says. "They'll find they can learn new things." Diane Curtis is a veteran education writer and a former editor for The George Lucas Educational Foundation.